Easily detect power lines hidden in your walls! 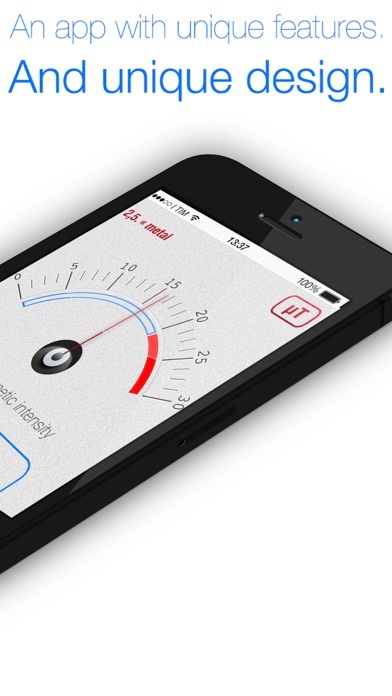 Power Line Detector is making use of the Magnetometer, that is built in every iPhone, iPod Touch or iPad. As you may know, every power line is emitting a magnetic field. The built in magnetometer can be used to detect these magnetic fields. • Remove any cover or frame that contains magnetic or metallic parts from your iPhone/iPod Touch/iPad. Magnetic and metallic parts are disturbing the measurement! • Move your iPhone slowly close to the area where you suspect a power line carrying voltage. ▸If a voltage is present the display will flash and the mG reading grows while the message "Voltage detected" appears. Note: mG stands for milliGauss, which is used to measure the strength of a magnetic field. You may want to test it before use by slowly moving it to an area where you are sure there is a voltage present, like the cable running to your room light. Computer and electronic devices are not the best choice to test the fundtion of the app, they are often heavily shielded against magnetic and electric fields (which denies a proper reading since a shielding alwaysx works both ways). Have fun with this handy tool!